Boiling Crab. Wow. So much food, so little manners. This is the type of place you go to for a binge session with your binge buddy. Who has time for utensils when it's all about stuffing your face with seafood and licking the garlic spices off your buttery fingers? We started off ordering something more classy. We had this grand plan of acting proper, then putting on our plastic bibs and ripping off little crustaceans' heads. Where is my mignonett, kind sir?! 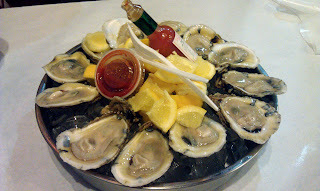 Oysters on the half shell ($15 a dozen), raw, with tabasco and lemon. Oh good, the bag of food came. One bag of shrimp ($9/1LB. ), and one bag of crawfish ($15/1LB. ), sir! You might be able to see it in this pic but there are half corns in there, too. We added 2 corn on the cobs ($.75 cent each).